How Much Fish Oil Should You Take for Inflammation? Fish oil, a dietary supplement, is high in omega-3 fatty acids. These unsaturated fats play a vital role in brain development and can help reduce the risk for heart disease and other chronic diseases. This is due in part to the anti-inflammatory properties of omega-3 fats. The recommended dosage of fish oil for treating inflammation is directly related to its omega-3 content. Consuming more than 3 grams of fish oil per day may present some risks. When you take fish oil for inflammation, count the total omega-3 fatty acid content rather than the total amount of fish oil you consume. Omega-3s in fish oil are broken down into two categories -- EPA, or eicosapentaenoic acid, and DHA, or docosahexaenoic acid. Adding the EPA and DHA content together will give you the total omega-3 content. 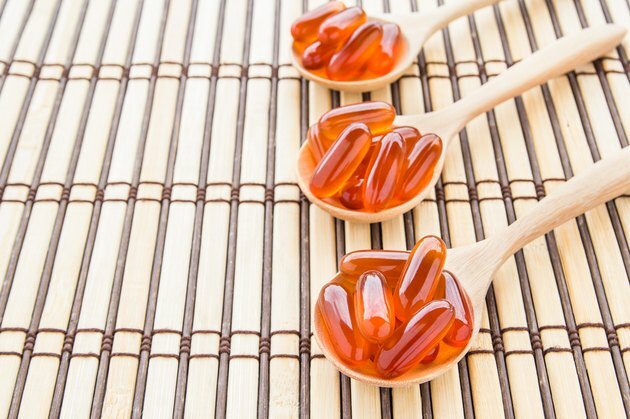 This is important because different types of fish oil can contain varying amounts of omega-3s. According to the University of Maryland Medical Center, fish oil capsules commonly contain 180 milligrams of EPA and 120 milligrams of DHA -- an amount much smaller than the total fish oil in a single capsule. Incorporating omega-3 fatty acids into your diet can help lower your risk for various diseases caused by inflammation, most notably arthritis, an inflammatory disease affecting the joints. UMMC notes that arthritis patients may be able to reduce their dosage of nonsteroidal anti-inflammatory drugs, such as ibuprofen, by taking fish oil. While there is no official dosage recommendation for arthritis, a study published in 2006 in "Surgical Neurology" found that consuming 1,200 milligrams of omega-3s per day was as effective as ibuprofen for reducing arthritis pain. There is no official recommendation for fish oil for reducing general inflammation. However, NYU Langone Medical Center notes that typical doses of fish oil range between 3 and 9 grams per day. The center also notes that, to match the doses used in various studies, you need to consume enough fish oil to supply between 2 and 3 grams of EPA and between 1 and 2.5 grams of DHA. Because this level of omega-3 could mean consuming many fish oil capsules, it may be most beneficial to purchase fish oil with the highest levels of omega-3 per serving. While relatively high levels of fish oil may be most effective in reducing inflammation, there also are some risks to consuming high levels. MedlinePlus notes that taking more than 3 grams of fish oil per day can interfere with blood clotting, which can increase your risk of bleeding. In addition, high doses may reduce immune function. Because fish oils can contain environmental pollutants, including mercury, consuming large amounts of fish oil may be unsafe. Side effects of fish oil can include heartburn, nausea, loose stools, rash, nosebleeds, bad breath and belching. According to MedlinePlus, you should only consume high doses of fish oil under medical supervision. Is Too Much Omega-3 Bad for You? How Much Fish Oil Should a Woman Take? How Many Omega Fish Oil Pills Should You Take a Day? Should You Eat Walnuts or Almonds for Omega-3?